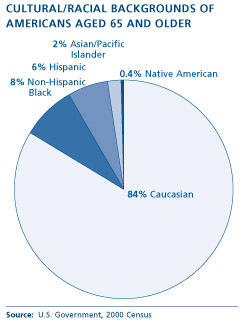 The population of older adults in the United States is becoming more culturally diverse. As a result, adult day health programs are more likely to be serving participants from a variety of cultures and ethnic backgrounds. The concept of culture is broader than race or ethnicity. It also encompasses language, communication styles, social values, and religious behaviors. Culture shapes how people view the world, their attitudes about health, and their food preferences. Cultural cuisines reflect the geography, climate, and history of the location where the culture developed. Within each culture (and within different regions where the culture is dispersed), people may prefer certain foods, food preparation methods, and food combinations for meals and snacks. Keep in mind that diversity within cultures is as important as diversity between cultures. People from the same cultural or ethnic group tend to have had some similar experiences. Within each group, however, individuals may vary in terms of income, social class, religion, age, education, geographic origin, and the length of time that they have lived in the United States. Due to this diversity within cultures, you cannot assume that all members of a culture share the same communication styles, health beliefs, and food preferences. General knowledge of cultural differences can provide a starting point for discussions about foods and people from diverse cultures.